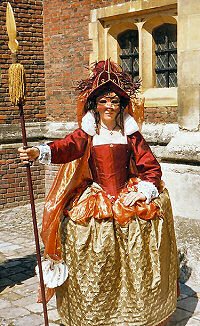 In August 2003 we performed an edited version of George Peele's court masque in Hampton Court's Great Hall, to mark the 400th anniversary of the death of Elizabeth I. We staged it in three consecutive parts with dance, music, gesture, costumes, and masks which attempted to replicate those of the time. 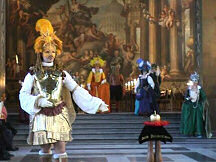 In December 2003 we performed it again, in the magnificent Painted Hall at Greenwich. The masque uses the story of the Judgement of Paris to pay an elaborate literary compliment to the Queen. It begins with the familiar events: Ate, goddess of discord, places a golden apple marked 'For the fairest' in the path of the three goddesses, Juno, Pallas and Venus. Unable to agree which of them should claim it, they agree to settle the matter by asking the next person who comes along. That person is the shepherd Paris of Troy, who chooses Venus, having been offered Helen, the most beautiful woman in the world, as a reward. According to the usual myth, Paris steals Helen from her Spartan husband, thus starting the Trojan War, with the spurned goddesses fanning the flames. However, the masque rewrites history, as Juno and Pallas refer the case to a court presided over by Apollo, who decides that Paris is not qualified to judge, and passes the decision to the maiden goddess Diana. Diana awards the apple to Elizabeth for her wisdom, beauty, majesty and chastity, a decision which all the goddesses applaud, thus saving the day while flattering the Queen. After the event, the audience was invited to join us in a song and some dancing.